1.Perfect design gives your remote control a unique look. 2.With good plastic material and high quality. 3.Simple to install and remove. 4.Provides full protection for your remote control. 5.Comes with a free screwdriver. 7.Available in many unique colors. 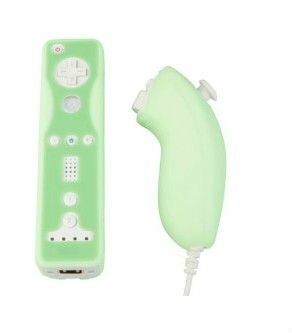 Welcome to buy Green Control Cover Case for Wii from us, we offer worldwide shipping! Thanks for visiting our website. We supply different kinds of video game accessories, all theaccessorieswe offer are of high quality and worldwide shipping. All the game accessories you purchased from here are 100% tested and quality guaranteed, and the price for Delicate Charming Control Cover Case for Wii is the most competitive compared with other providers. Moreover, we will give you more discount if you purchase in big quantity for the Delicate Charming Control Cover Case for Wii . We accept PayPal as our payment method, it is fast, convenient and safe! When the order has done, we will choose the best way to ship your remote Controller cover according to the shipping address you've given. We also have a very professional customer service team, they will deal with your orders and answer all your questions in time to make sure you get the best service and experience on our site. Enjoy your trip again, thank you!